In 2016, Midway Atoll National Wildlife Refuge began a phenology monitoring project using the USA-NPN’s plant and animal observation program, Nature’s Notebook to document the timing between leaf out and seed development of invasive Verbesina encelioides, or golden crownbeard. Verbesina is fast-growing and forms dense, monotypic stands that disrupts and degrades surface-nesting seabird habitat, and is linked to lower reproductive success and survival of albatross. 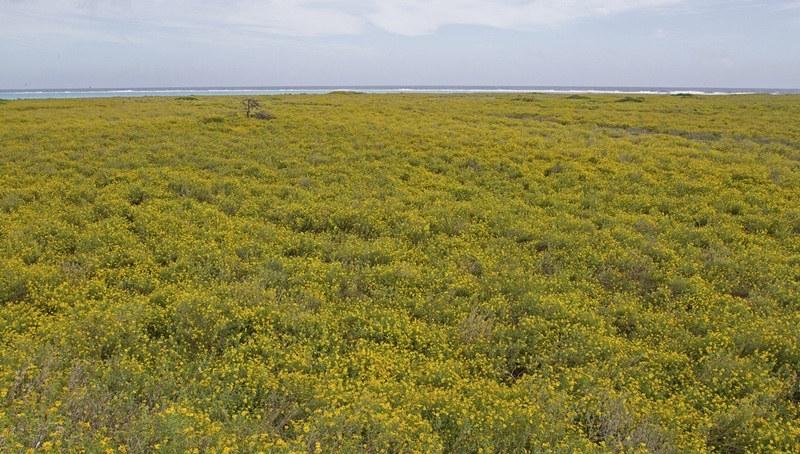 Verbesina used to cover 70% of the land surface across both Eastern and Sand Islands at Midway before large scale control efforts eliminated 99% of this invasive by 2015. Phenology monitoring efforts aid a focused, surgical approach to eliminate the remaining individuals, informing the Refuge staff when to visit and treat all of the sectors of the Park to work toward total eradication.